Last year we visited the Florida Keys History and Discovery Center and I was intrigued by the history of the Keys. I purchased a book and have just now gotten around to reading it. The first chapter struck me when it mentioned the early diet of the natives that inhabited the keys early on. I assumed a diet of food from the sea and I was right but didn't think about it including manatees. According to the author though the manatees were reserved for the chief and other bigwigs. But what did they eat with it? After all a good healthy diet needs some fruit and veggies. 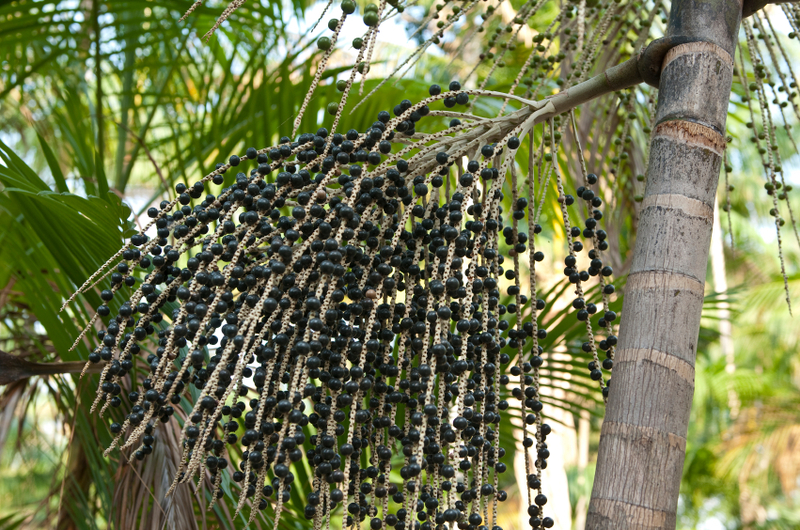 The paragraph went on to say that they also ate coconuts (a given) and a variety of wild fruits that included sea grapes, coco plums and palm berries. Now you can't take an Ohio girl and put her in a tropical climate and expect her to know the plants so I began a little search for knowledge. 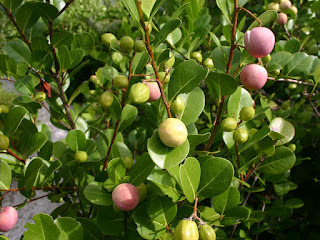 Sea grapes are a familiar plant seen often near the shore line in many southern beaches. I remember seeing warning signs in several places telling people that sea grapes are a protected plant in Florida. The plant can grow quite large and offers a lot of shade to areas where other shade trees may not be able to grow. They produce grapes similar to those we find to make wine from or eat as a snack. The sea grapes I learned are not particularly palatable on their own. They have a sweet acidic taste. You only eat the dark purple ones and apparently they are more seed than flesh. People who do harvest them for consumption usually make a jelly from them. Just be aware that in Florida you can only harvest from plants grown on private property and you absolutely need the owner's permission. 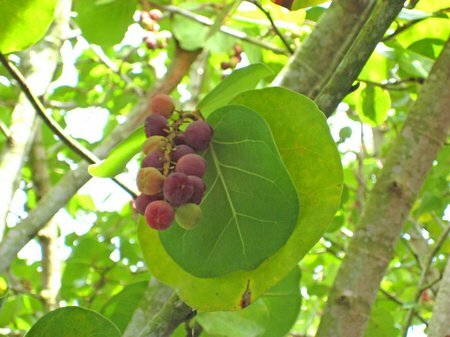 Another fruit that apparently should be made into jelly for eating is coco plum. I didn't realize how prevalent this plant is in the landscape. One report said that the fruit tastes like "astringent sweet cotton." I'm not sure what that means. 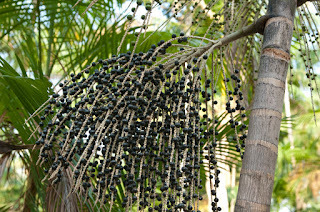 I have seen palm trees that have berries rather than large coconuts but never knew that they were acai berries. Where have I been? Acai is one of those fruits held in high esteem for curing all sorts of things and slowing aging. I used to buy them in the store because I liked the taste of them covered in chocolate. (If I found a good recipe for chocolate covered broccoli I might start eating more of that). The trick with all of these is to know what is a good berry and what is not which makes me wonder how many natives died or got really sick before they discovered the difference. Oh, and wash them down with good water. There were several places in the keys where there were actually fresh springs or pools of water. Well, now that I've learned all that it's time to go back to reading. I'm to the part where the Spaniards and the British are skirmishing over the rights to the Florida Keys. And let's not leave that close neighbor Cuba out of the dispute. Then there's that upstart country called America. I hear they won out.